I’m not a huge fan of cornbread. It can be dry or too moist or even greasy. But sometimes cornbread can be perfect, especially when served with a really spicy vegetarian chili or a colourful black bean salad. For me, it’s something that doesn’t stand up too well on its own, but it sure makes a great accompaniment. This cornbread isn’t too sweet or heavy. Its got a nice bit of texture from the frozen corn and the cheese is always a nice touch! Plus, it’s super quick to whip up a batch in time for dinner. Don’t have buttermilk, just use milk plus a teaspoon of vinegar for the same effect (or mix a little plain yogurt into the milk). Leftovers can be eaten cold from the fridge, but I like it best heated up in the oven for a bit just so the sides can get nice and crisp. Preheat oven to 400. Mix together the first 6 ingredients, flour to 3/4 cup of cheese, reserving the rest of the cheese as a topping. In another bowl, combine the wet ingredients, buttermilk to oil and pour into dry mixture, careful not to over mix. Pour batter into a greased 9×12 pan and top with remaining cheese. Bake for 18-20 minutes or until tester comes out clean. Cornbread is a old time favourite of mine.I especially enjoy the crunchy bits stuck to the pan and warm out of the oven with some butter on it. Oh boy!! I’ve made it with cheddar and I’ve also made it with jalapenos. It’s such a quick and easy way to liven up a bowl of chili in the Fall or Winter. Oh yum! I just made cornbread today too but mine doesn’t have cheese in it. I’m loving yours! My husband and I – both born and raised southerners (he from SC and me from AL) have a disagreement on cornbread and what is allowed to be in it. For me, there is nothing sweet about cornbread. It can have cheese and chunks of corn and sour cream and jalapenos and a LOT of things added to it, but sugar should never, ever be one of those things. We have literally had loud, yelling arguments over this point. bijoux, we had a bit of a cool spat, weather-wise and this (and some chili) was just the fix. eb, i hope so. i don’t think this is traditional in anyway, but it sure is tasty! oh that looks delicious! My family is from the south (US) and I grew up with cornbread. This looks like it would make my grandma proud. I never thought of putting maple syrup in cornbread. I use honey sometimes but I love maple-flavored anything so that sounds right up my alley. I make a recipe very similar – except I think mine calls for creamed corn but no maple syrup (which probably equal out in sweetness). It’s really delicious – I like to put a big wedge in a bowl, then pour chili over top. Yum – warm soups are one of the things that help me accept the cold gray days of winter (plus roasted squashes – butternut, spaghetti, etc). I’m really not ready for summer to finish this year. MAN! I LOVE cornbread; sweet or tangy, with veggie chili or barbeque, alone with jam or butter, sliced, diced, or crumbs! I love cornbread! THANKS much for this recipe! 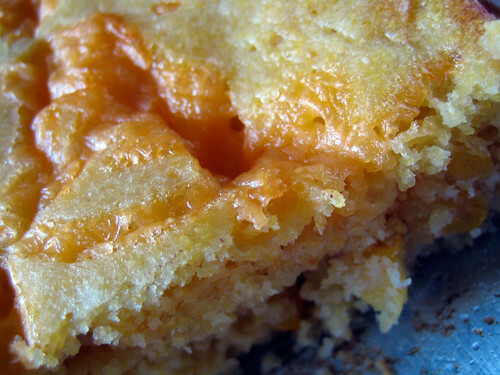 I on the other hand LOVE cornbread–it’s one of my favorite foods in the world! And this one looks like a fine specimen!! yum! yummy! I want a bowl of chili to go with the bread! I am the biggest fan of cornbread! This looks delicious! I like cornbread recipes with buttermilk in it, although I’ve never thought to use maple syrup…I will have to give this a try. This looks delicious and I love the idea of a little maple syrup added. Might have to try this bread this weekend. I made this last night to go with a sweet and savory kale dish. It was wonderful–barely sweet, with great texture and a just enough saltiness. I kept going back for “just a one more little slice” all evening. maris, the maple doesn’t really add a huge maple flavour, but it works well here. maija, i’m not ready for summer to end either! judy, i don’t have much experience with cornbread, either. but this one is good! cupcakes and cornbread, cakespy, you are always surprising me! enjoy this, bellini, when the urge strikes! give this a try laura and let me know what you think! sarahkate, i hope you enjoyed it! I tried this the other day, and it was a HUGE hit with the fam! We had it with baked chicken and green beans, and it was perfect!! Thank you so much for all the recipes! I only wish you’d post more!! katybelle, thanks for your kind words. 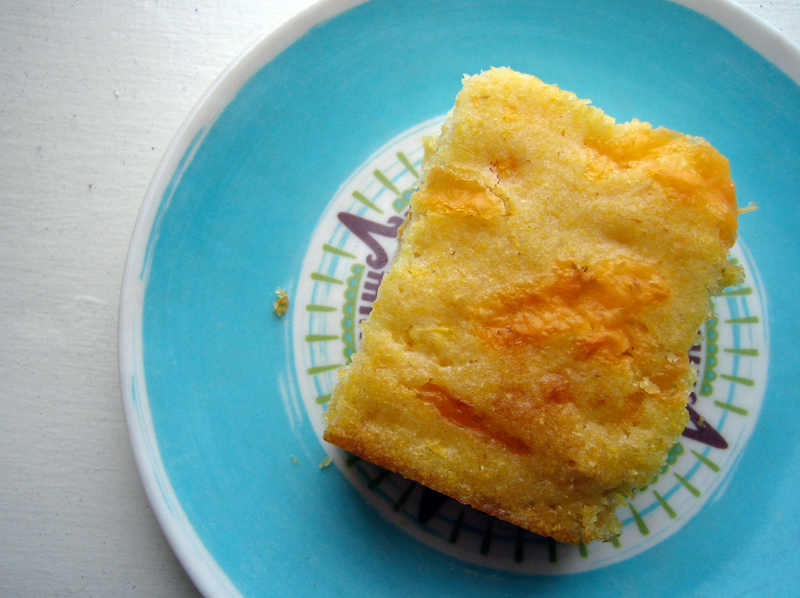 glad you loved the cornbread…and i will try to post more! it’s just that sometimes, life and work get in the way. My dad made the best cornbread in the world, courtesy of his Texas roots. He would put oil in an iron skillet and heat it up really hot in the oven (sometimes he’d put it on a top burner) before he poured the batter in. This is what gives cornbread a good crust on the bottom. The batter should sizzle when it hits the hot oil. My, this is so good… and so quick to put together!! I served this with a hot beef chili, what a great combo:-) I halved the recipe and did it in a 8 x 8 pan, which I oiled and preheated in the oven to help crisp the sides. I used coarse polenta, which gives great texture. Fantastic!! a keeper!! Thank you for all those inspiring and yet easygoing recipes. I love your blog! When we do not have buttermilk on hand we just use an equal amount of plain yogurt which has worked for us. Cornbread fans as well!! I love this recipe… have you tried freezing it? I wonder if the texture would be OK.
Hi Iris, I haven’t tried freezing it, but I’m sure it would work well.